Concord-Carlisle senior captain John Mulligan scored 27 of his game-high 30 points in the first half, as the Patriots knocked off Weston. Mulligan made 8 3-pointers, including 7 in the first half. CONCORD, Mass. - Friday night’s Dual County League contest between the Weston Wildcats and the Concord-Carlisle Patriots was a wild one. The game included three players who scored at least 20 points, 15 total 3-pointers, and a head coach being ejected. When all was said and done in Concord on Friday night, Concord-Carlisle (13-5) extended its winning streak to eight games by taking down Weston (19-3) by a score of 87-70. The first half was dominated by the host Patriots and, in particular, senior captain John Mulligan. Mulligan scored 27 of his game-high 30 points in the first 16 minutes of the game. Mulligan made 7 of his 8 3-point attempts in the first half. Concord-Carlisle head coach David Cohen said that Mulligan’s sharp shooting in the first half was key to his team’s victory. “In the first half, (Mulligan) completely carried us,” Cohen said after the contest. Cohen added that he has never seen a player as hot from behind the arc as Mulligan was against Weston. Mulligan said he had an inkling before the game that he would have a productive night on offense. “I could kind of tell (before the game) that I was feeling it,” Mulligan said after the victory, adding that Friday’s performance was the best shooting performance he’s had in his basketball career. Mulligan made four 3-pointers in the first period. A long pass from Concord-Carlisle senior captain David Poor (18 points, 11 rebounds, 5 assists) set up a layup by Mulligan, which put the Patriots up 23-8 at the end of the first quarter. Weston joined the three-point fever early in the second quarter. Seniors Jared Groff (8 points, 2 steals) and Cam Peddie, who put in 13 points against the Patriots, cut the Concord-Carlisle advantage to 25-14. Concord-Carlisle countered with three-pointers by Mulligan and senior captain Spencer Patenaude, which gave C-C a 31-14 lead. Patenaude played well on both sides of the ball on Friday, scoring 27 points, pulling down 13 rebounds, and collecting 3 steals. 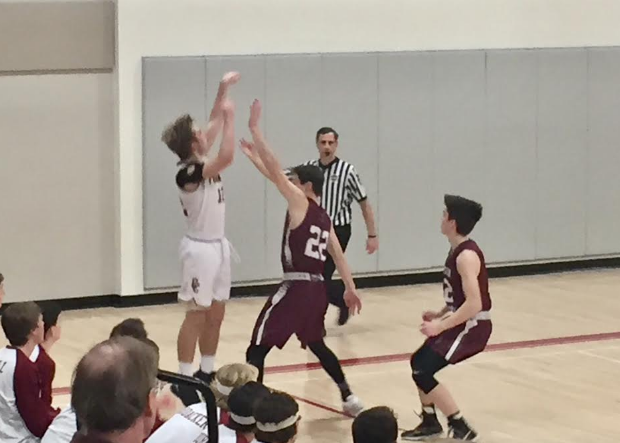 Mulligan made two more shots from beyond the arc in the second quarter, making the Weston deficit 40-22 with two minutes before halftime. With 1:05 remaining the the first half, Weston head coach Dave First received a double technical for arguing and was ejected. Concord-Carlisle took full advantage. Mulligan made all four free throws following the double technical, opening up a 44-23 lead for the Patriots. Peddie completed an old-fashioned three-point play with under a minute remaining in the second quarter. Concord-Carlisle took a 44-26 lead into the locker room at halftime. It appeared that Mulligan would have preferred to keep the game going and skip the ten-minute break at halftime, as he missed his first five shots of the second half. Luckily for C-C, Patenaude continued putting the ball in the basket for the Patriots. Concord-Carlisle began the third quarter on an 11-4 run, with Patenaude scoring 7 points over that span. The game was not over yet, however, as the Wildcats worked their way back into the game. They incorporated a full-court press on the Patriots, and switched from man-to-man into a 3-2 zone. That approach worked for a while, as Weston trapped the Patriots and forced turnovers. The Wildcats collected 12 steals against Concord-Carlisle. Sparked by their newfound success on the defensive end, the Wildcats closed the third quarter on a 17-2 run. Sophomore Kyle Murphy (team-high 28 points, 5 rebounds, 3 steals) and sophomore Junior Uga (13 points) scored 15 of Weston’s 17 points over that span. While Concord-Carlisle took a 57-47 lead into the fourth quarter, Weston took the momentum into the final period. The Wildcats picked up right where they left off to begin the fourth quarter. Uga forced a Patriot turnover, made a driving layup while being fouled, and made the free throw, cutting the Concord-Carlisle advantage to 57-50. The Patriots responded with a quick 7-0 run. Two free throws and a bucket by Poor, followed by a three-pointer by junior Matt Moreau (5 points) gave Concord-Carlisle a 64-52 lead. A steal and driving layup by Murphy, followed by a basket and a free throw by senior Doug Dahl (9 points, 2 blocks) diminished Weston’s deficit to 64-58. After the two teams traded baskets to make the score 66-60, a basket by Poor and Mulligan’s eighth three-pointer of the night gave the Patriots a 71-60 advantage. At this point, the Patriots were able to solve the puzzle of Weston’s press. The Patriots threw football-esque passes down the court, which led to easy layups for Concord-Carlisle. Coach Cohen said that Concord-Carlisle used the 6-foot-7-inch frame of Poor to inbound the ball down the stretch, which allowed the Patriots to put the game away. Cohen said that “using (Poor) to break the pressure and being able to see over the top” was key to Concord-Carlisle breaking Weston’s press. Weston never got within seven points of the Patriots for the remainder of the game, and Concord-Carlisle closed the contest on an 8-0 run to clinch the victory. The Patriots played a very smart game against Weston. They rode Mulligan’s hot hand in the first half, and when Weston make a comeback, Concord-Carlisle did not panic. They made the necessary adjustments to break the press, and the Patriots ultimately won by 17 points against a team that looks like a Division 3 state championship contender. For Weston, the first half was very frustrating, but there was simply no slowing down Mulligan. The Wildcats showed a lot of resiliency for cutting their deficit to six, especially after their head coach was ejected. Weston will get the chance to move on and wrap up its regular season on Monday when it visits Martha’s Vineyard. Concord-Carlisle will look to extend its winning streak to nine games on Monday when it hosts Dual County rival Bedford.